But protesters say the threat is being hyped to prevent them from exercising their free speech. Suicide bombers. Chemical or biological attacks. Lone gunmen. Terrorist attacks. Riots. Blockades that could shut down the Republican National Convention. In its most explicit arguments to date, the St. Paul city attorney’s office on Friday outlined the “calamitous” potential of granting a request by antiwar demonstrators to change the route and time of a Sept. 1 march outside the Xcel Energy Center. Protest organizers accused the city of scare tactics designed to legitimize the denial of free speech. The dire warnings by the city came in a legal brief it filed to support the permit restrictions it is placing on the antiwar group. The city warned of “immeasurable risks to public safety and security” if protesters were allowed a march route that could total 100,000 and encircle the Xcel, site of the Sept. 1-4 convention. At the Minneapolis offices of the Coalition to March on the RNC and Stop the War, Jessica Sundin, one of the group’s leaders, accused authorities of exaggerating the threats. “There are no experiences in recent history of conventions being targeted by the kind of violence they are describing in their brief,” said Sundin, who has taken a leave from her clerical job at the University of Minnesota. “They are raising a specter of terrorism that is absolutely unfounded, and they are using it to prevent us from speaking out against terrorism being inflicted on the Iraqi people every day by U.S. occupation forces,” said Sundin, who took the leave to work on the protest. St. Paul officials and the protesters have been engaged in a prolonged dispute over when a permit for the march would be issued and, lately, over details of the permit. In mid-May, police granted a permit that allows demonstrators to march to the Xcel from the State Capitol and back. Attorneys for the American Civil Liberties Union of Minnesota and the National Lawyers Guild filed briefs this month saying the march route is too narrow, the turn-around too abrupt, and the noon-to-2 p.m. period allowed for the demonstration too early in the day, occurring before convention delegates arrive at the center. A hearing on the matter is scheduled for July 9 before U.S. District Judge Joan Ericksen. City officials have repeatedly said that they welcome nonviolent protesters and that they have gone out of their way to accommodate the free speech concerns of dissenters. The projected size of the antiwar demonstration on the first day has been estimated at between 50,000 and 100,000, although there has been some speculation it could be smaller, depending on the situation in Iraq. While St. Paul Assistant Police Chief Matt Bostrom previously has made references to potential threats, such as the detonation of a bomb, or blockades by anarchist groups, Friday’s court filing was the most detailed description about concerns of law enforcement. Included with the brief is a memorandum from John A. Kolerno, the Secret Service coordinator for the convention, who noted that attendees typically include a range of high- ranking officials. 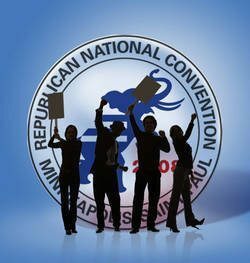 He cited a “self-described anarchist/anti-authoritarian” group known as the RNC Welcoming Committee, which has advocated a “three-tier strategy” of blocking the Xcel Center, “immobilizing” delegates’ transportation and blocking connecting bridges. He referred to “violent riots” that occurred in Seattle in 1999, when he said the city failed to heed threats to shut down meetings of the World Trade Organization. And he said St. Paul needed to have unimpeded traffic flow for emergency vehicles to get to and from the Xcel Center, if necessary. Tom Walsh, who has been the Police Department’s main spokesman on police preparation for the convention, said Friday night that he had not seen the court documents and could not comment. Charles Samuelson, executive director of the ACLU of Minnesota, said he reviewed the documents Friday afternoon. “It’s a litany of everything that could possibly go wrong whether they grant a permit or not,” he said. “In order to eliminate every possible risk, they should have every delegate stay home, provide broadband connection for every delegate, give them computers and let them watch the televised show from an undisclosed location. A group planning a poor people’s march at the Republican National Convention filed suit in U.S. District Court on Tuesday, alleging that St. Paul police failed to grant a permit for the demonstration.The Poor People’s Economic Human Rights Campaign wants to march from Mears Park to the Xcel Energy Center on Sept. 2. This is the second federal suit concerning convention protests. An antiwar group planning a march on Labor Day, Sept. 1, has also sued the city of St. Paul, seeking a different route and time than the one police gave them. Cheri Honkala, national organizer for the poor people’s campaign, said police issued her group a permit for Mears Park, but not for the march. Tom Walsh, a St. Paul police spokesman, cited problems with the march application. He said Sept. 2 is a business day, and police must accommodate protesters and traffic. He said the application has the march going from University Avenue to Cedar Street, but Cedar passes over University and there’s no pedestrian access between the two. “People are looking at the application and there are questions that need to be ironed out,” he said. Honkala challenged the police view, saying the route could work and if police saw a problem with it, they could have called her group’s lawyers or her. Jordan Kushner, one of the group’s attorneys, said police hadn’t met ordinance and guideline deadlines and were stonewalling protesters.